Most middle-aged women experience bloating at some point during their lives, especially over the course of the menstrual cycle, but for some women it becomes more severe and difficult to manage. Severe stomach bloating can be difficult to live with, but read on about the condition and ways you may be able to relieve symptoms. Bloating is a condition in which your stomach or abdomen feels excessively full or tight. It can often be seen in the swelling of the abdomen, as well. However, in severe bloating, this feeling is exacerbated. There is no measurement to tell if your bloating is normal or severe, but you should be able to depend on your past experience of normal bloating to recognize whether your current situation is more severe than normal. If your bloating is severe, you should always visit a doctor in order to receive a diagnosis and find the right treatment plan. Most treatment will involve dietary changes, but there may be medications specific to each condition that can help as well. Many women going through menopause begin to experience bloating more often than they had before the menopause transition began. This is because of the association between estrogen and the digestive system. One thing that estrogen controls is water retention in the body. When levels of estrogen begin to change and become unpredictable, so does the water retention and bloating comes along with it. Estrogen can also affect levels of bile, which the body uses to digest fats. If there is not enough bile, the body will have trouble with digesting and this may cause bloating. Bloating due to menopause is not always severe, but because of the many changes during this period, it may become more intense than normal. The intestines and the digestive system as a whole are filled with good bacteria, which help the body digest foods and receive nutrients. However, there are times when the bacteria may over-reproduce become a problem, especially in the small intestine where there should only be low levels of bacteria. Symptoms include bloating as well as cramps, gas, and diarrhea. This disorder is an autoimmune problem that tends to cause damage and inflammation in the intestines. It can also cause a feeling of bloating, especially feeling bloated in the upper abdomen, as well as a number of digestive symptoms like diarrhea or constipation and other symptoms like fever and fatigue. IBS is a digestive disease that is not fully understood. However, it commonly causes symptoms like severe bloating, along with other digestive problems including constipation, diarrhea, abdominal pain, and changes in bowel habits. Certain types of cancer may also cause digestive problems like severe bloating. Although severe bloating is a difficult problem, learning more about the condition can prepare you to deal with it. To learn more, read about the top three herbal remedies for bloating. 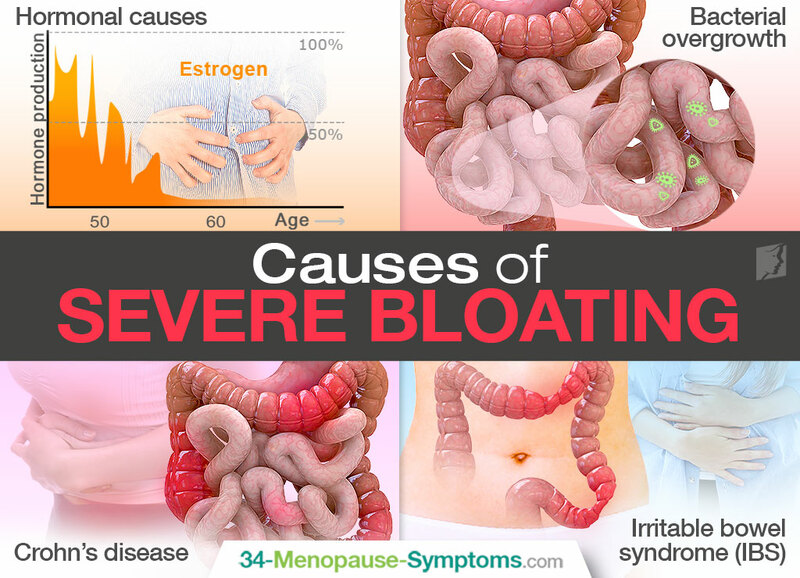 This article outlines some of the less obvious things related to chronic constant bloating. Menstrual Periods and Bloating: Are They Linked? Many women experience bloating during their menstrual periods. This article gives a bit more information about bloating and periods.